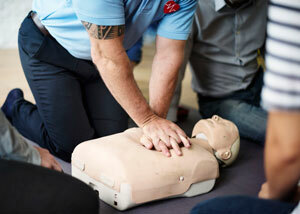 CPR Course Online - CPR Certification & Renewal with AED Training. Learn Cardiopulmonary Resuscitation (CPR) techniques and AED use through our comprehensive CPR Course Online. You will learn conventional CPR techniques (Chest Compressions & rescue Breaths) as well as hands-only CPR (Chest Compressions only) for Adult, Child and Infant care. You will also learn how to properly use an Automated External Defibrillator (AED). The course consists of 10 lessons and an online CPR quiz. After completing the course material and passing the quiz, you will receive your CPR certification online to satisfy your work or school requirements. 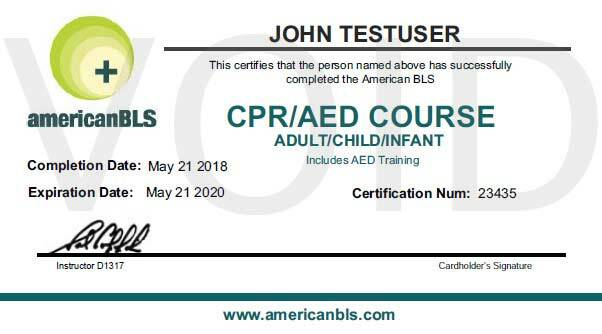 The American BLS+ CPR Certification has a 98% approval rate and is accepted nationally including Puerto Rico and other countries. CPR for Adult, Child and Infant care. Have a group of individuals that need CPR/AED training? We offer discount to groups of 5 or more individuals. The group rate is $15 per certification. We can either setup the accounts for you or issue a promo code for your members. You members can take the CPR Course Online at their convenience and we can report the progress back to you. Please contact us for more information on group discounts on our online CPR courses. The online CPR Certification course takes 2-3 hours to complete. The CPR training material takes approximately 2 hours to go through in its entirety. The CPR certification exam takes approximately 1 hour. Why get Your CPR Certification Online? There is no need to make an appointment and travel to a live class to learn CPR when the course can be done online. Our state-of-the-art interface teaches CPR with carefully written lessons, detailed imagery and animations, and easy to follow videos. Our staff instructors are best in the business and are standing by to answer questions you might have during the course. Once you have finished the course, you are administered the CPR quiz and after passing, you can get your CPR certification online for 18.95. After finishing the course, you will receive a printable CPR certification card immediately and an official wallet card will be signed by the instructor and mailed to you within 1 business day. You can receive your CPR certification online, at any time through American BLS+. The CPR Course online covers conventional Cardiopulmonary Resuscitation (CPR) techniques, Hands-Only CPR, choking care, and how to use an AED. The course covers adult, child and infant care. The course is administered online and uses a combination of written lesson plans, graphics, pictures, animations and video to present the material . After the course, a CPR quiz is administered to test the knowledge of the CPR & AED techniques.